Allows for a table at the conference OR a logo in the program. If attending the mindfulness and sports psychology trainings. If attending mindfulness and sports psychology trainings for CE credits. Allows for a table at the conference, logo in the program, and brief announcement during the Welcome Speech. 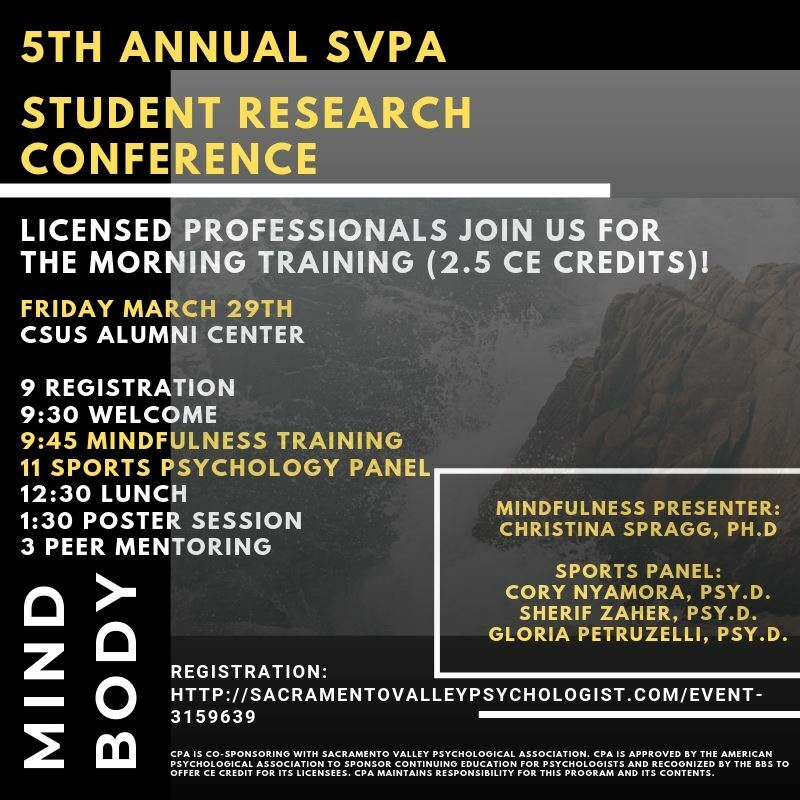 Sacramento Valley Psychological Association (SVPA) is hosting it’s fifth annual Student Research Conference (SRC) at the Sacramento State University Alumni Center. This years morning presentation will commence with a mindfulness training led by Dr. Christina Spragg, that will focus on the importance and utilization of mindfulness techniques. This training will be followed by a panel of sports psychologist and professional athletes that will be discussing the impact of wellness, mental health, and mindset on physical performance and mind-body health. Both presentation segments will provide a general overview of mindfulness and how mindfulness affects brain functioning, as well as common misconceptions regarding its practice. The primary focus will be on the use of mindfulness practice as a complement to traditional cognitive-behavioral therapy, particularly in the treatment of athletes. The audience will have an opportunity to participate in a mindfulness exercise and ask questions during the panel. Email Student Representative Tori Galvez at vgalvez@alliant.edu for more information and to submit applications. Must register. 2.5 CE credits pending approval from CPA for licensed professionals for attending the Mindfulness Training AND Sports Psychology Panel. Please contact drcheperka@gmail.com for more information. CPA is co-sponsoring with Sacramento Valley Psychological Association. CPA is approved by the American Psychological Association to sponsor continuing education for psychologists and recognized by the BBS to offer CE credit for its licensees. CPA maintains responsibility for this program and its contents.